A man holds up a Catalan flag as people gather at the final pro-independence rally at Plaza Espana ahead of Sunday&apos;s referendum vote on September 29th, 2017, in Barcelona, Spain. 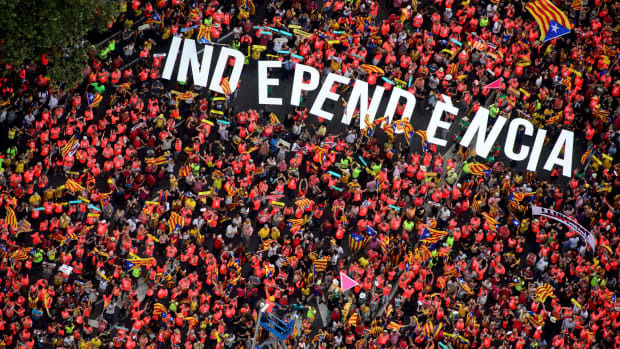 In recent weeks, the dispute over Catalonia&apos;s quest for independence from Spain has captivated the attention of many parts of the world. 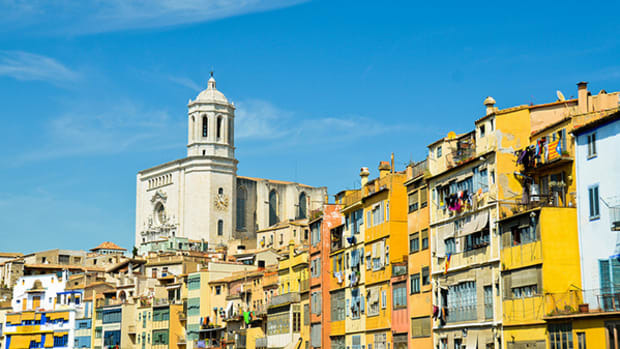 There is concern about further outbreaks of violence if the government in Madrid and the Catalonian independence movement cannot resolve their differences. This has led commentators to call for the European Union to step in and mediate. But such hopes are not well founded. The E.U. has neither the tools nor the will to tackle the separatist crisis in Spain. First, the conflict over Catalonia&apos;s status comes at a less than ideal time for the E.U. Officials in Brussels are consumed with thorny negotiations over the United Kingdom&apos;s withdrawal from the E.U., the continuing flow of migrants to Europe, and challenges to the rule of law in Poland and Hungary, to name just a few issues. There is crisis fatigue in the E.U. and limited enthusiasm for trying to put out another fire. Second, the E.U. is not equipped, for legal and political reasons, to tackle separatist disputes like the one in Catalonia. As journalist Natalie Nougayrède points out, the E.U. cannot dictate how member states organize themselves or interact with their regions. Article 4.2 of the 2009 Lisbon Treaty, which revised the key constitutional treaties of the E.U., states that the E.U. will not interfere with key state functions such as "territorial integrity" or "maintaining law and order." This means member states still largely dictate the policies of the E.U. and the member states have shown no willingness to back the Catalan separatists. This stems, in part, from a feeling of solidarity with the state of Spain. Some of the major powers in Europe are also distracted by major domestic challenges, be it Brexit for the U.K., reforming the labor market in France, or negotiating a new coalition government in Germany. But ultimately, member states are worried about creating a precedent. 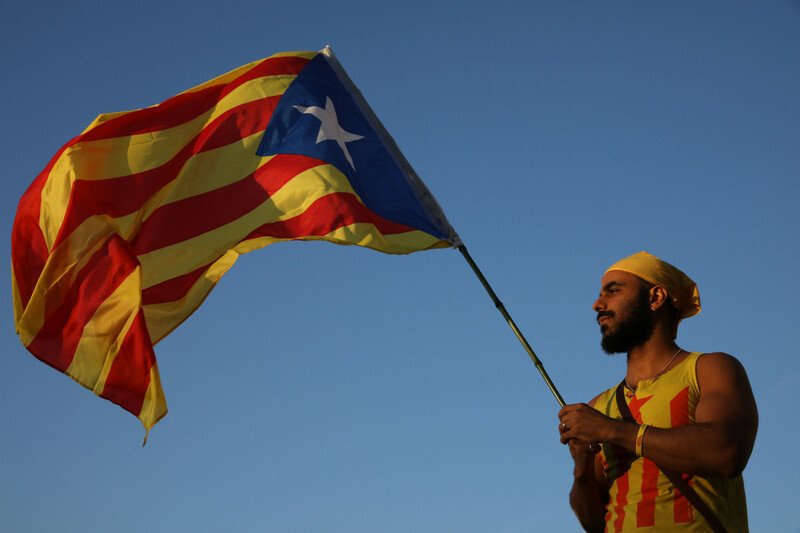 Providing support for the independence movement in Catalonia, which is in open conflict with the Spanish government, could embolden other separatist forces across the continent, such as the Flemish in Belgium, the Corsicans in France, or the Lombards in Italy. In that sense, Kosovo provides a telling reminder of the general reticence toward secession movements among E.U. member states. Although it unilaterally declared independence nine years ago, five members of the E.U.—Spain, Slovakia, Greece, Romania, and Cyprus—still refuse to this day to formally recognize the sovereignty of the Balkan country. Third, even acting as a mediator in Catalonia&apos;s dispute would be a stretch for the E.U. This is not for a lack of experience or success. For example, in the Balkans, the E.U. managed to broker a major agreement in 2013, which allowed Serbia and Kosovo to normalize relations. It also intervened in the midst of a 2015 political crisis in Macedonia, following revelations that the government had illegally wiretapped many opposition figures. The 2015 Prižno agreement, mediated by the E.U., proposed a roadmap to de-escalate the situation. But, what worked in that one region cannot be easily applied to the Catalan case. While the major protagonists in the Balkans welcomed E.U. assistance, Spain regards the current dispute as a purely domestic matter. Whereas the E.U. had some leverage in the Balkans, either through its financial aid or the promise of potential membership, it lacks similar clout regarding Spain and Catalonia. The E.U. would have little to offer the Catalan separatists to encourage them to compromise. The E.U.&apos;s so-called "Prodi doctrine," named after the former president of the European Commission, clarifies that any region breaking away from an E.U. member state would be automatically kicked out, and would then have to go through the lengthy application process to have a chance to rejoin. Fourth, focusing on the rule of law and upholding democratic norms could also prove challenging for the E.U. in this case. Certainly, some European leaders condemned the heavy-handed response of the Spanish police during the October 1st vote in Catalonia, which left hundreds injured. But E.U. 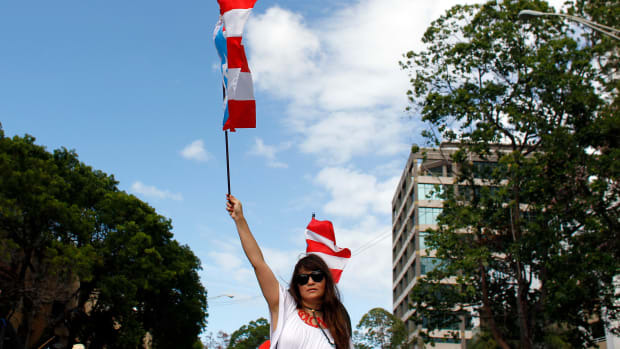 officials equally highlighted that the referendum was clearly illegal, not in line with good referendum practices, and in violation of the Spanish constitution. Moreover, there is no sign currently that the E.U. is considering punishing the Spanish government for its use of force in reaction to the vote. But even if the situation worsened, and Spain once again resorted to excessive force, the E.U. lacks effective tools to hold member states accountable for not living by fundamental democratic values. As scholars Heather Grabbe and Stefan Lehne explain, member states are reluctant to allow too much oversight from the E.U. when it comes to monitoring the rule of law. Article 7 of the 2009 Lisbon Treaty lists possible sanctions that the E.U. could pursue if a member state does not respect key values. These include suspending a country&apos;s voting rights. But Article 7 requires a high threshold of support among member states for its activation and implementation. 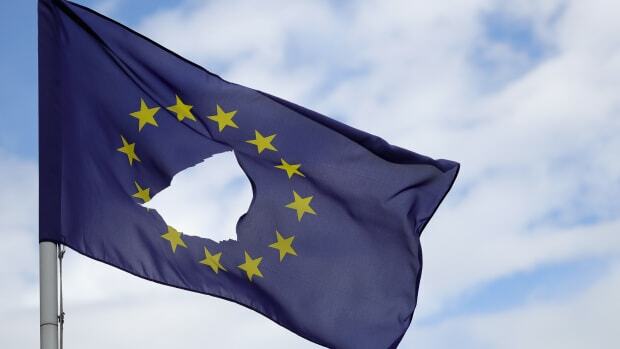 Indeed, you need the support of at least 80 percent of the member states, as well as the consent of the European Parliament, to even officially determine that a country may be at risk of breaching key E.U. values. It is no surprise then that Article 7 has not been used to this day. This is not to say that the E.U. should stay on the sidelines. Offering informal mediation advice, keeping in close contact with the Spanish government and the Catalan separatists, and constantly calling for a peaceful solution to this dispute, would not hurt. But, the key to a long-term solution, whether amendments to the Spanish constitution that would allow referendums or strengthening Spain&apos;s Senate as a representative of the country&apos;s regions, rests with the Spanish actors. The E.U. has enough on its plate as it is. This article was originally published on The Conversation. Read the original article. Garret Martin is a professorial lecturer at American University School of International Service. 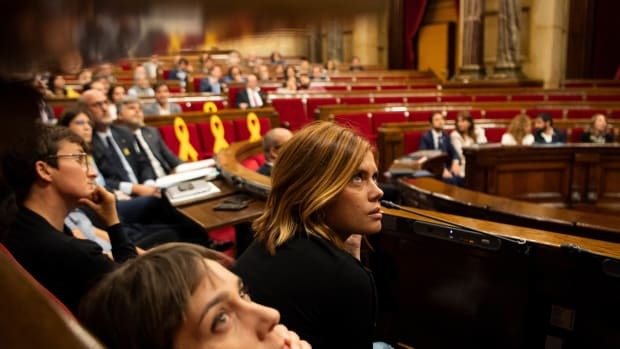 Members of the Parliament of Catalonia voted to reject a suspension of former Catalan President Carles Puigdemont and five others from government service. A million and a half people formed a human chain across Catalunya today to call for the region's break from a crippled country.